It's harder and harder to get a satisfying meal in Singapore at a song. Even casual cafes and bistros will ring up a tab of double digits, especially with a drink thrown in. That leaves us pretty much with hawker food, but a lot of which is deteriorating in quality and taste. Even though it's cheap, it doesn't feel like money's worth. So here are my picks for the best tasty lunches at S$5 or less, including a drink (like calorie-free choices Coke light or Coke zero at about S$1.20 a can). Noodles are a great one-dish option, and there are so many varieties to pick from. Fishballs served with heart and soul. These are handmade daily, from 100% pure fresh yellow tail fish. 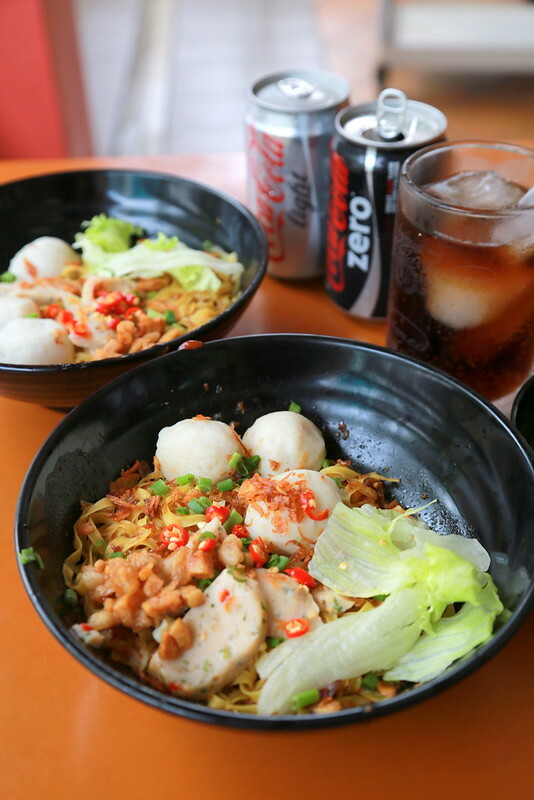 Young hawker entrepreneur Douglas Ng uses his grandmother's recipe and the fishballs are gorgeously sweet, soft and bouncy - the way they really need to taste like. He also handmakes the chili-scallion fishcakes, the sambal, and the fried pork lard. The noodles are done just right - dry with a nice bite. 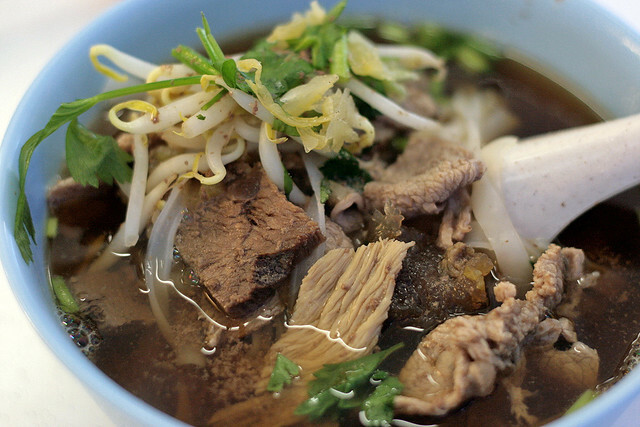 A S$3.50 bowl of this hearty meepok will have you smiling all day. For the past 10 years, these Pork Rib Noodles were selling at an unbelievable S$2 at the Frontier (Science canteen) Noodles Stall. The thin QQ (bouncy with bite) noodles are topped generously with five chunky pieces of deliciously braised pork. All of this drenched in a lovely garlicky soy and sesame oil dressing. 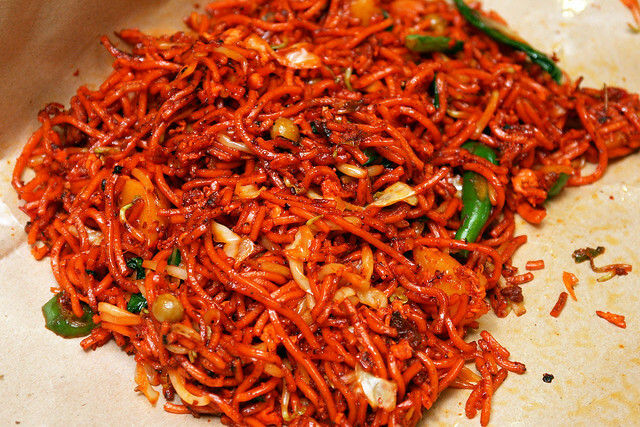 You could also have this with kway teow or bee tai mak. Prices have just recently increased by 30-50 cents but it's still the best S$2+ you will fork out. When you go for a heavy fried noodle, make sure the calories are worth it! Ajimer Sharif serves up a nice version with morsels of smoky mutton, crunchy beansprouts and cabbage, tegg, fresh green chili, peas and potato cubes. The yellow noodles have soaked up flavour and smoky aromas, but remain firm. A mere S$3.50 gets you a very large plate. But it's so tasty, you won't want to share it. Another noteworthy young hawker Terence Chee, 24, has earned recognition for making a seriously good Hokkien fried prawn noodle. It is sumptuously gooey with rich stock gravy, topped with slices of cuttlefish, fresh prawns from Thailand, crispy pork lard, and roast pork. Terence who already has more than 8 years cooking experience, learnt his trade from masters who were willing to teach. And he is extremely particular about his stock. One mouthful and you can tell. A worthy treat from S$3.50 onwards. This comes from the historic Odeon beef noodle stall (Hwa Heng Hainanese Beef Noodles) that was opposite the old Odeon theatre at North Bridge Road in the 1970s. The stall is run by the younger of the two brothers who own the business. The stock is brewed for 5-6 hours with 10 herbs, so it comes out beautifully herbal, robust and fortifying. The dry version comes with a smooth dark gravy. You must try the chili sauce with cincalok for an unusual seafood dash to the flavours. Prices start from S$3.50.